Italy had been an early adopter of the Maxim gun, but found the available supply of Maxims dried up quickly with the onset of World War I. The Italian Army was in serious need of machine guns, and not many factories were able to sell significant quantities to foreign nations – so Italy had to look to a domestic design. The answer came from Captain Betel Abiel Revelli, who had recently developed the M1910 Glisenti pistol that became standard issue for Italian officers. Revelli had been developing the gun mostly on his own initiative since 1908 in cooperation with the Fiat automotive company in Turin. In 1914 the Italian government quickly adopted the gun, and Fiat was able to immediately begin mass production. The M1914 Revelli was a mixture of concepts from the Maxim and unique ideas found (perhaps for good reason) in very few other guns. Externally, the gun looks fairly typical, is you ignore the giant square hole in the side of the receiver. It uses a water jacket around the barrel for cooling, a typical type of tripod, and spade grips with a thumb trigger. Beyond that, the design gets interesting. Mechanically, the Revelli is a recoil-delayed blowback mechanism. The gun fires from a closed bolt, and when ready to fire the barrel and bolt are locked together by a wedge. The barrel and bolt assembly move backwards a few millimeters from the recoil of firing, and that movement cams the wedge out of contact with the bolt, so that when the barrel stops moving the bolt may continue backwards from the forces of inertia and residual gas pressure in the barrel. Interestingly, the locking wedge position can actually be adjusted after removing the side cover of the receiver. Somewhat like tuning the timing of a car engine, this can allow the gunner to ensure that the gun runs smoothly in different conditions and with different types of ammunition. The firing mechanism is a striker, and )somewhat unusually for a water-cooled heavy MG) the gun has selector settings for both semiautomatic and full automatic fire, as well as safe. The semiauto setting it marked “Lenta”, or “slow”. The rear end of the bolt is exposed, and has a T-shaped grip to allow the gun to be charged manually. However, a firer does need to be careful, as the bolt reciprocates with every shot, traveling in the cutout area above the rear portion of the receiver (its travel ends at the recoil buffer mounted to the front of the spade grip). You really do not want to let a finger wander into that space when firing. The water jacket has an unusual and thoughtful feature – in addition to the standard filling plug on top, it has two drain plugs on the bottom. One is to relieve steam pressure into a condensing can (as with all water-cooled guns), and the other allows the use of a manual recirculating pump to move condensed water back into the jacket. With all this, we’ve been avoiding the elephant in the room with the Revelli: it’s magazine. Instead of using a belt, of typical (and practical) box magazine, the Revelli uses a multi-column “squirrel cage” magazine that holds 50 rounds (100-round examples were also made). The magazine has 10 separate columns, each holding 5 rounds under pressure with a separate spring. The unit is inserted in the left side of the gun, and indexes on the first column of cartridges. Once they are all fired, the box is pulled inward and indexes on the next column, somewhat like a typewriter. This continues until the final column is fired, at which point the box falls out the right side of the gun and a new one can be inserted. In theory, this provides a fairly compact magazine, but it has a multitude of practical problems. First, the construction is flimsy, and the magazines are easily dented (in particular, when they fall out empty). Once dented, they are unlikely to work reliably. Furthermore, if any one of the ten recoil springs becomes weak, or any of the 20 feed lips is not quite right, the gun will malfunction. Loading could be done singly, or with a loading tool that allowe you to simultaneously load rounds into 5 of the columns. However, it’s worth noting that these magazines had no compatibility with the 6-round Mannlicher type clips Italy was using in their Carcano rifles at the time. It’s no surprise that this magazine system was changed in the later version of the Revelli, and not used by any other production guns (ever). The Revelli saw use as both a ground and aircraft gun (the latter without the water jacket, and often mounted in pairs). It fired the 6.5x52mm Carcano cartridge at a rate of 400-500 rounds per minute. 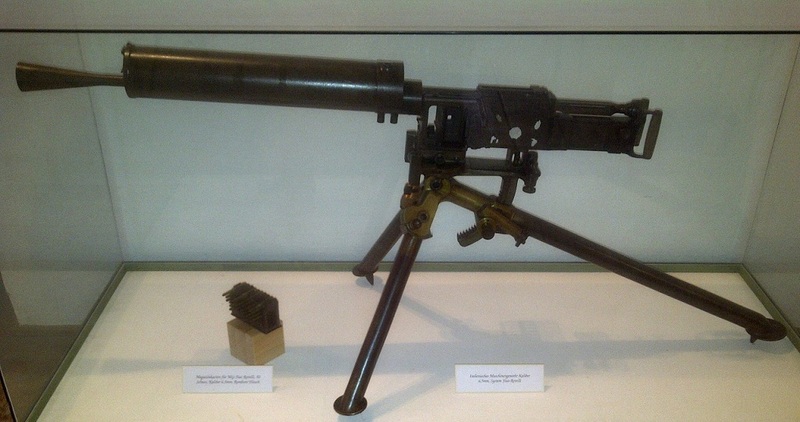 The gun was used throughout World War I, and a modified 1935 variant saw use in World War II as well. It is widely alleged that the Fiat-Revelli was built with a cartridge oiler, but according to an article written for the small arms defense journal, there was none found! So if this gun required oil, I assume that in the early variants someone threw the oil on the magazine prior to inserting it into the receiver of the Fiat-Revelli. Can anyone help me determine what was really going on with this?